Caldwell, Idaho — Repeating as champion at any major rodeo on the schedule is a massive feat for barrel racers—competition on the top level is so tight, mere hundredths of a second often separating the champions from second, third and more. So when 2017 Caldwell Night Rodeo Champion Stevi Hillman took the victory lap at the 84th annual edition of the rodeo in 2018 on Saturday night, August 18, that was impressive in its own right. What made the feat even more amazing was the fact that Hillman managed it on two different horses. In 2017 Hillman brought the young gun, MCM Imasharpguy, aka Sharpie to his first Caldwell rodeo and put up two times under the seventeen second mark, the previous arena record. His 16.68 in the second go round set a new record and was one of the most impressive runs of the year. She broke seventeen again in the finals to cap off her title week in style. 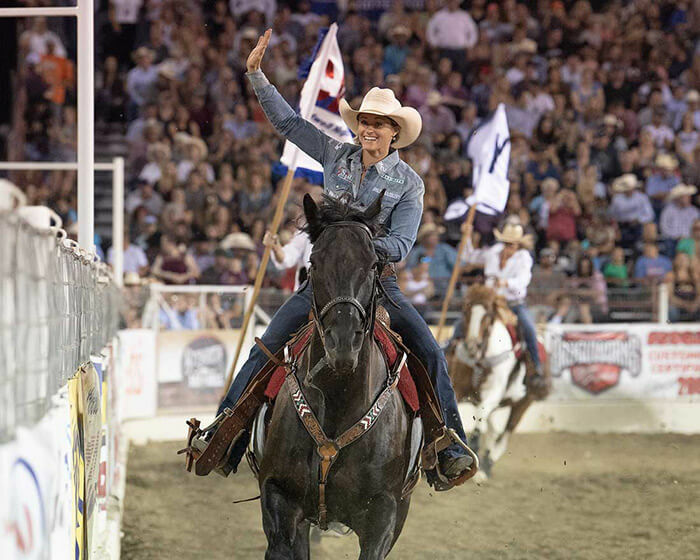 Returning in 2018 with the rodeo season winding down, Hillman called on her “old reliable,” the horse she calls Truck who has been a big piece of her two Wrangler National Finals Rodeo (WNFR) appearances and has her well on her way back to Las Vegas this season. In addition to being lucrative with its $20,000 added committee purse, the Caldwell rodeo is also a stop on the Wrangler ProRodeo Tour, one of the final stops in fact, so competitors came looking for valuable Tour points to help secure their spot inside the top 24 of the Tour standings, thus earning a place at the Justin Finale in Puyallup, Wash., next month. That rodeo will also have a large purse, one of the biggest in the final weeks of the season, and could have a big impact on who competes in Las Vegas come December. 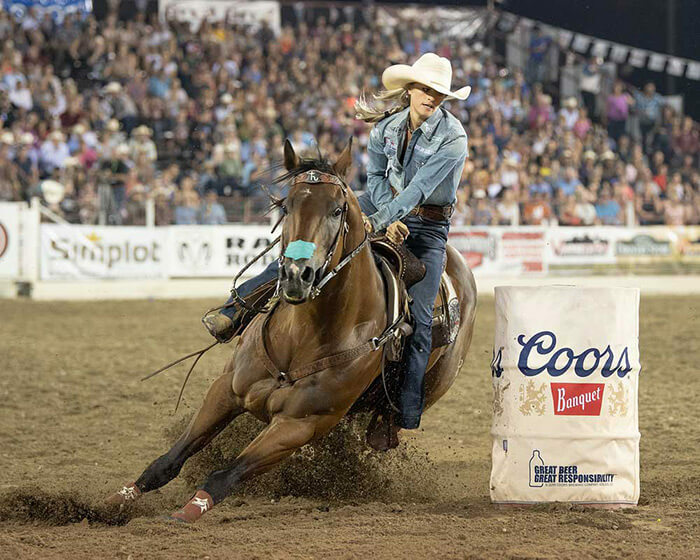 Hillman’s place at the Wrangler NFR is pretty secure—the cowgirl came to Idaho ranked fifth in the WPRA World standings with more than $100,000 won this year—as is her chances at Puyallup. She was ranked seventh in the Tour standings prior to her week at Caldwell. The Caldwell Night Rodeo begins with a long round held during morning slack, Tuesday, August 14, a round that certainly highlighted just how tough it is to win in professional rodeo barrel racing. Hillman and Truck took second in that round behind Columbia River Circuit champ Teri Bangart by one one-hundredth of a second with Ivy Conrado third by the same margin. Their times were 17.29, 17.30 and 17.31, respectively. As the second round progresses from slack through four performances, contestants have a shot to compete in front of one of the rowdiest crowds in all of ProRodeo. Caldwell is known for its crowd participation, a contest every year between the Rowdies and Civies on either side of the big Caldwell arena and the rodeo athletes sit right in the middle of it all. Hillman took her second run on Thursday night, landing second in the go again, this time behind Conrado. She stopped the clock at 17.17 while Conrado won the go aboard J-Lo with a 17.09 posted on Wednesday night. Hillman’s two-run total had her right on Conrado’s heels as the Championship Round began on Saturday night featuring the top 12 from the average. With an exciting race for the title in Caldwell, the other big story was the cowgirls on the bubble for a Wrangler NFR qualification who had big showings to reach the finals here too. Conrado has been steadily climbing the standings all summer and came here ranked 11th but in a tight race— in the standings behind her, there is just about $10,000 separating her from 18th ranked Tiany Schuster. In that group from 11th to 18th are Amberleigh Moore, Carley Richardson and Tammy Fischer, who all punched their tickets to the Championships in Caldwell along with long shots Bangart, ranked 25th, Katelyn Scott, ranked 36th, and Andrea Busby, ranked 37th. The finals did not disappoint. Truck was smoking to win yet another big outdoor rodeo. In the final round, he bent around every turn with Hillman riding her heart out. Despite having the crowd holding its breath on each corner, Hillman galloped away with the round win at 16.85 seconds. It was the fastest run of the rodeo. Bangart finished second with a 17.09. Hillman’s three run average time of 51.32 seconds took first ahead of Conrado’s 51.61 with Bangart and Moore third and fourth, respectively. Hillman posted to social media following the win. She acknowledged the rare feat in her repeat. Hillman collected $7,628 for her three runs, further cementing her spot in the standings. As the only other cowgirl to place in every payoff, Conrado’s earnings of $6,144 give her some room to breathe as well. Bangart was third high money winner with $5,066. For more information on the Caldwell Night Rodeo, visit them on-line at www.caldwellnightrodeo.com.